Farm policy issues, a gigantic tradeshow featuring new products and technology, several nationally known speakers and a keynote by U.S. Ag Secretary Tom Vilsack are just few of the many facets of Commodity Classic which starts today and ends Saturday in Kissimmee, Florida. A record-breaking crowd of nearly 6,000 people is expected to attend the nation’s largest farmer-run tradeshow. State and national commodity organizations will be in action as they gather for state caucus and national corn congress meetings to discuss future farm policy. South Dakota Corn will be very active and well represented with nine board directors from both the SDCGA and SDCUC, with six of them serving as delegates at the two corn congress sessions. The farm bill, ethanol policy and crop insurance will be the major topics discussed at this year’s meetings. The tradeshow involves hundreds of exhibitors from all realms of agriculture showing off their new or soon to be released products. Commodity Classic will also be filled with the opportunity to listen to over 30 different educational seminars on everything from advanced precision technology to farm estate planning. One new feature to Commodity Classic 2013 is the new app to help you plan your day. This app provides schedule times, directions, maps, exhibitor information and even a twitter feed. Speaking of Twitter, whether you’re going to Commodity Classic or not, you can follow along on twitter with the hashtag: #Classic13. 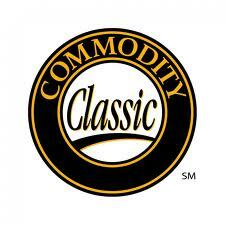 This entry was posted in News and tagged Commodity Classic, corn, farm, South Dakota.